Well, [Order ID] is a candidate fact and the other 3 fields - upon inspection - are only attributes of this fact; they do not increase our Grain. For example, [Order ID] CA-2011-112326, will always be attached to the same [Customer Name], [Order Date] and [Ship Date]; so we only need the fact [Order ID] to account for this level. We can, however, see that for [Order ID] CA-2011-112326 there are multiple rows, one for each of the [Product Name]s in that [Order ID]. As well as [Product Name] we have [Category] and [Sub-Category], but these are just attributes of [Product Name]. For example, [Product Name] ‘GBC Standard Plastic Binding Systems Combs’ will always be [Category] = ‘Office Supplies’ and [Sub-Category] = ‘Binders’… So the Granularity of this data is [Order ID], [Product Name]; these 2 fields define what one row represents. I’d like to include this data in my analysis. It would be a good 'opportunities indicator' to see where the company under-trades with respect to population…and also to see in which states it over-trades (…it’s in our nature to look for negatives to fix, but equally valuable is to look for the positives to repeat, if only we can answer: Why are doing better here? ', we can then do more of it and replicate it elsewhere!). Should we Join, or should we use a Data-Blend? First let’s determine the Granularity of our population data-set. 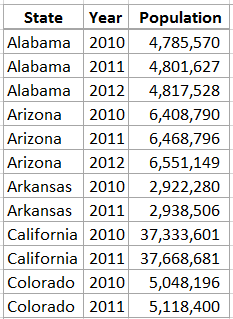 Hopefully an easy one here as I only have 'facts'…so the 'Grain' of this table is [State], [Year] (as each row represents the population for each state for a particular year). trick to only return a single mark. This is a level of complexity I don't want to get into, and will have to do this every time I want to use this measure (without State in my Viz); it's going to be hard work, inefficient...and generally not fun! OK, so what if we use a Data Blend? 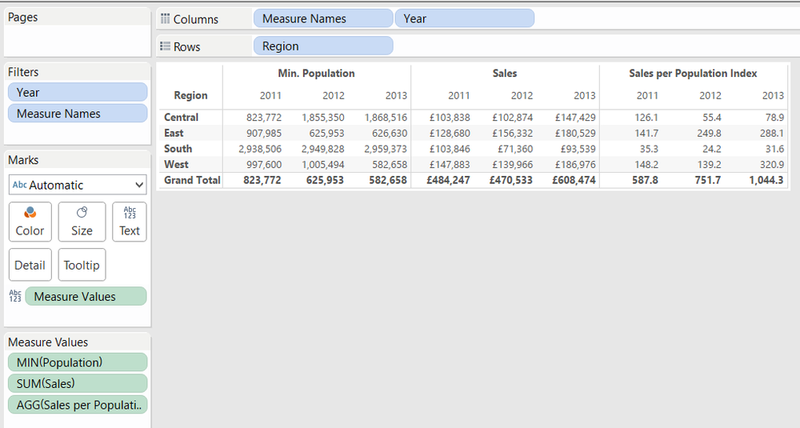 What is Tableau doing when we Blend? When we blend in Tableau, it creates an aggregated version of the measure we are bringing in (from the secondary data source), with the 'Level of Aggregation' set at the blend-field(s) level, and then joining this back to the primary data source (joined on those fields). This is also the reason you can only bring in blended measures and dimensions as Aggregates, and not row level. This makes blending, as a way of joining 'Master Data' attributes a bad idea. So now it has no concept of [State], and the Aggregation is only blended on [Year], so we no longer have any difference between Regions, and the population is only different for each year. Tableau Tip: Although we don't want to do this here, this is a useful trick (especially when using a self-blend - that is creating a duplicate of your data source and using this to blend). At Atheon we use this trick in one of our Retail Analytics models; the model lets the user select a series of products to see how they perform, but we also wanted to show the 'Category' performance at the same time...Although we could now do this with a LoD calculation, we built the model pre-LoD-Calculations and used a self-blend, and only select 'Category' as the blend field. So when should we Blend, and when should we Join? One use-case is when the data resides in different ‘schema’. 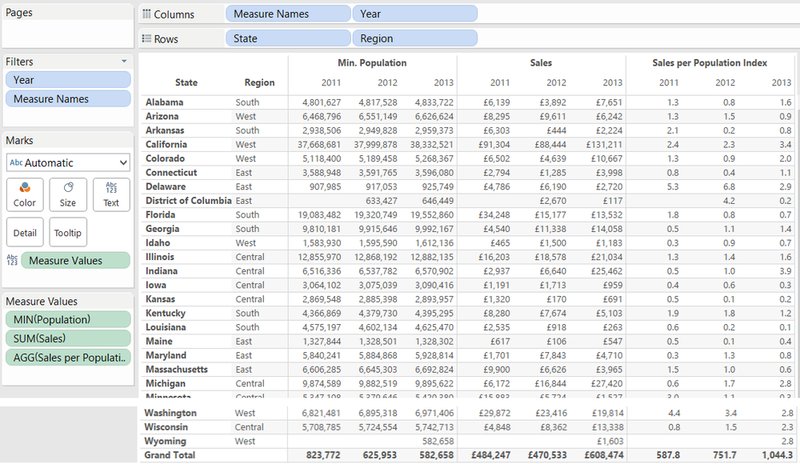 A schema, as defined in Tableau, is a single Excel workbook (where each tab forms a single schema), or a single text file (if they are in a single folder), or for a database a ‘schema’ is…well a schema! I see this as a fringe case, as it’s nearly always possible (by hook, or by crook!) to get data into a single schema (even if the tables need to be materialized into text files and those files placed in the same file location), and do a proper join (if appropriate). The main use case, IMHO, for data blending, and taking full advantage of Tableau’s ‘aggregate-and-join’ functionality, is when the 2 different data sources have different levels of granularity. I love this about Tableau's data-blends, as it gives a different option to joining when the data is at different 'Grains'. I read many comments on the community regarding making blending a 'real' join...this is what Joins are for, leave blending for what blending is for! I hope this helps remove the 'frustration' of when Blends don't act like 'real' joins, and you too will come to love the Blend as much as I do!